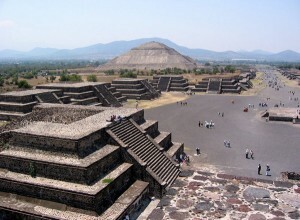 The pyramid site of Teotihuacan is one of the truly sacred power places on the planet. It is where the Toltecs thrived from 200‐700 AD recognizing their truest potential — that we are more than physical bodies and physical experiences, we are energy systems of consciousness. Teotihuacan translated means “where Human becomes God” embracing that we are experiencing the Human and the Divine simultaneously in this journey of life. The essence of Teo allows the seekers to heal aspects of themselves through honest exploration and ancient ceremonies held throughout the pyramid site that has been walked by generations before them and with the guidance of the inherent magic that is Teotihuacan. This healing creates deep changes in our lives that we carry home with us. Join Liz Forrest as she guides and supports you on this 5‐day Power Journey, reminding you of who you really are and what is truly possible. The next journey to Teotihuacan, Mexico will be during Spring break, March 2019! The intent of this revitalizing experience is to awaken your energy and reclaim your personal freedom in the homeland of the Toltecs sacred pyramid site. This year we travel forth working with the theme of renewal. How would you like to renew your relationship to your self and your relationships with others? Join Liz Forrest on this Spring Equinox Power Journey where you will connect with the essence of this energizing land and participate in sacred ceremony in the warmth and heart of Teotihuacan, Mexico. Gain refreshing insights to give you clarity relating to self and others. Live from the authenticity of who you truly are in body, mind and spirit. The first 5 days will be spent at the pyramid site, exploring in-depth the teaching and ceremonies of the Toltec. We’ll stay nearby in beautiful accommodations with lush tropical fauna surrounding and enjoy delicious homemade Mexican cuisine. The last 3 days will be hosted by Toltec elder Valentin Cervantes in his family home. He will be sharing his traditions and culture with us at other sacred sites in the area. Trip includes ceremonies at the pyramids, teachings, meals, accommodations, airport transfers to and from Mexico City Airport. Does not include: airfare or travel insurance. Spaces for the journey are limited. Please register as soon as possible. No refunds after March 1st, 2019. To reserve your place on the Journey, choose an option below and click the Pay Now button below to be taken to PayPal.